Today’s health-and-eco-conscious consumer cares deeply about what is put into the products they feed their pets. Animal lovers increasingly choose pet food that is organic, clean label, and protected in earth-friendly packaging. However, many pet brands are still stuck using heavy, rigid packaging that burns more fuel during transportation and doesn’t fully protect the product from outside contaminants. Fortunately, for producers selling larger quantities of pet food, a new packaging solution is available that meets consumer demand and saves your company a bundle. Our high-quality, quad-seal dog food packaging can hold 15 to 30 pounds of product while standing up proudly on retail shelves. If you take a look around your local pet store, you’ll see a number of brands packaging dog food in larger bags that lay flat on shelves or floors. These paper bags use a fin seal, meaning once they have been opened by a consumer, they cannot be neatly or easily resealed. This results in spoiled, spilled, and wasted product, as well as exposure to moisture, oxygen, vapor, and pests. All of these issues can kill a brand’s reputation and cost companies an unnecessary amount of money. Innovative brands, however, are able to truly stand out on retail shelves using stand up pouches as the preferred big bags for packaging dog food. This dog food packaging is made of multiple laminated layers of food-grade barrier film that supports user-friendly, re-closable features.  All bags can be produced with regular zip locks, slide zippers, or Velcro closures depending on your company’s and customer’s preference. Pet owners will prefer this method of packaging dog food over the rest because it’s a green solution that best protects products from bacteria and pests, and it’s easy to transport, open, and reclose. The protective layers are puncture resistant, so consumers don’t have to worry about their critters getting into the packaging as soon as they bring it home. Because these big bags for packaging dog food are flexible and structurally sound, they’re much less bulky and burdensome than traditional cardboard boxes or flat bags. While standing up in pet store aisles, they boldly boast your branding using vibrant hues and eye-catching graphics produced in the rotogravure printing process. This solution for dog food packaging has been used by leading pet food brands – on a much smaller scale – for treats and other lesser quantities of pet products. Now, the same exceptional quality of packaging can be used to protect and present large volumes of pet food without being awkward to carry or pour. These bags seal in flavor, aroma, and freshness so producers and consumers alike can be sure their hard-earned dollars aren’t going to waste due to prematurely expired product. 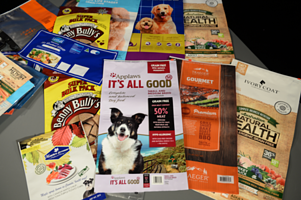 When it comes to choosing the safest, highest-quality, and eco-friendly big bags for dog food, this innovative solution will help boost your brand and get your product into major retail stores.